A decentralised system in systems theory is a system in which lower level components operate on local information to accomplish global goals. 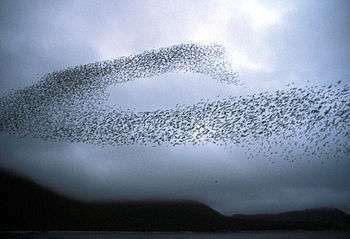 The global pattern of behaviour is an emergent property of dynamical mechanisms that act upon local components, such as indirect communication, rather than the result of a central ordering influence (see centralised system). One of the most well known examples of a "natural" decentralised system is one used by certain insect colonies. In these insect colonies, control is distributed among the homogeneous biological agents who act upon local information and local interactions to collectively create complex, global behaviour. While individually exhibiting simple behaviours, these agents achieve global goals such as feeding the colony or raising the brood by using dynamical mechanisms like non-explicit communication and exploiting their closely coupled action and perception systems. Without any form of central control, these insect colonies achieve global goals by performing required tasks, responding to changing conditions in the colony environment in terms of task-activity, and subsequently adjusting the number of workers performing each task to ensure that all tasks are completed. For example, ant colonies guide their global behaviour (in terms of foraging, patrolling, brood care, and nest maintenance) using a pulsing, shifting web of spatio-temporal patterned interactions that rely on antennal contact rate and olfactory sensing. While these interactions consist of both interactions with the environment and each other, ants do not direct the behaviour of other ants and thus never have a "central controller" dictating what is to be done to achieve global goals. ↑ Bekey, G. A. (2005). Autonomous Robots: From Biological Inspiration to Implementation and Control. Cambridge, MA: MIT Press. ↑ Bonabeau, Eric; Theraulaz, Guy; Deneubourg, Jean-Louls; Aron, Serge; Camazine, Scott (1997). "Self-organization in social insects". Trends in Ecology & Evolution. 12 (5): 188. doi:10.1016/S0169-5347(97)01048-3. 1 2 Gordon, D. (2010). Ant Encounters: Interaction Networks and Colony Behavior. Princeton, NJ: Princeton U Press. ↑ Robinson, EJ; Feinerman, O; Franks, NR (2009). "Flexible task allocation and the organization of work in ants". Proceedings. Biological sciences / the Royal Society. 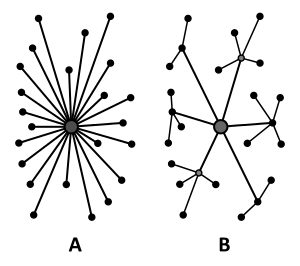 276 (1677): 4373–80. doi:10.1098/rspb.2009.1244. PMC 2817103 . PMID 19776072. ↑ Greene, Michael J.; Gordon, Deborah M. (2003). "Social insects: Cuticular hydrocarbons inform task decisions". Nature. 423 (6935): 32. doi:10.1038/423032a. PMID 12721617. ↑ Greene, Michael J.; Pinter-Wollman, Noa; Gordon, Deborah M. (2013). Fenton, Brock, ed. "Interactions with Combined Chemical Cues Inform Harvester Ant Foragers' Decisions to Leave the Nest in Search of Food". PLoS ONE. 8 (1): e52219. doi:10.1371/journal.pone.0052219. PMC 3540075 . PMID 23308106. ↑ Carey, Bjorn (May 15, 2013). 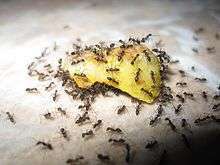 "Evolution shapes new rules for ant behavior, Stanford research finds". Stanford Report. Retrieved November 21, 2013. ↑ Reeve, Hudson K.; Gamboa, George J. (1987). "Queen Regulation of Worker Foraging in Paper Wasps: A Social Feedback Control System (Polistes Fuscatus, Hymenoptera: Vespidae)". Behaviour. 102 (3): 147. doi:10.1163/156853986X00090. ↑ Brooks, R. (1986). "A robust layered control system for a mobile robot". IEEE Journal on Robotics and Automation. 2: 14. doi:10.1109/JRA.1986.1087032. ↑ Minar, N.; Burkhart, R.; Lang- ton, C.; Askenazi, M. (1996). "The Swarm Simulation System: A Toolkit for Building Multi-Agent Simulations". SFI Working Papers. Sante Fe Institute.